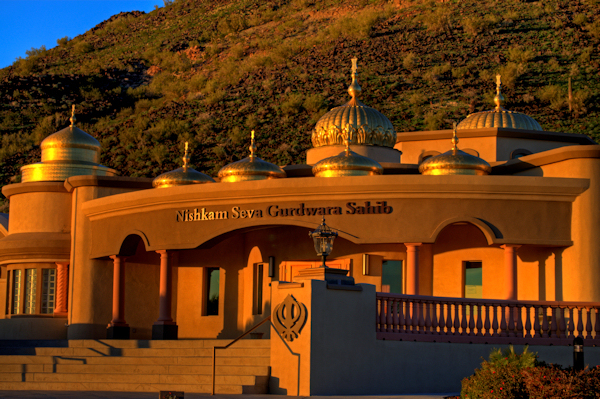 I think I’ve mentioned previously on my blog that there’s a Sikh temple just off the freeway that I see everyday on my commute to and from work. 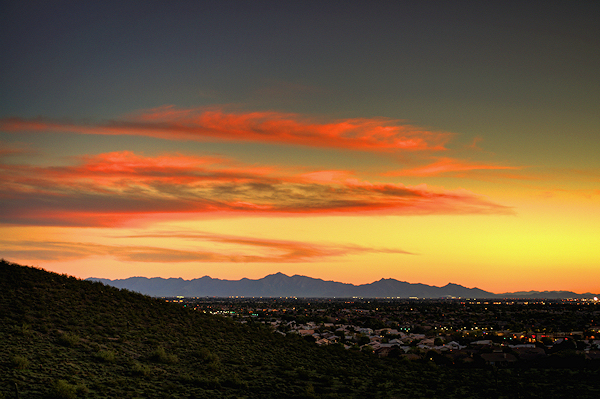 It faces the setting sun and has nine gold-leaf covered domes that absolutely glow when the sun goes down. Well, today I stopped by there on my way home from work. The gate was open and there was no one around, so I felt free to grab my camera and tripod for some bracketed shots. I believe that his facility serves as both a temple and a community center. I was able to get a nice series of shots of the building with the setting sun hitting the domes, and then I also got a couple of shots that included the nearly-full moon above one of the domes. There is also one other shot that I got under the archway, but I’m working on some masking on that one. It’s tedious work, but I think it could wind up being the best shot of the day–I’ll let you know how it turns out. Although I missed the most dramatic part of sunset, I now have another location in my scouting notebook where I know I can get to quickly. I would have stayed longer to get more of the blue hour, but I didn’t feel especially confident about hiking back down the rocky hillside in my slick shoes in the dark…so I took the coward’s way out and descended while there was still a little daylight left. All of today’s shots were done in bracketed series of three (-2.0/0/+2.0) at ISO 100, aperture-priority, with an 18-55mm Nikkor VR zoom lens. I processed them as HDR’s in Photomatix, and then post-processed in Paintshop Pro X3. So it was a very Zen-filled evening–a great way to unwind after a busy day, prowling around in the sunset and then watching the results come to life on the computer. I’ve uploaded the best shots of the evening to Flicker (click here). Hope you’ll check them out and let me know what you think! 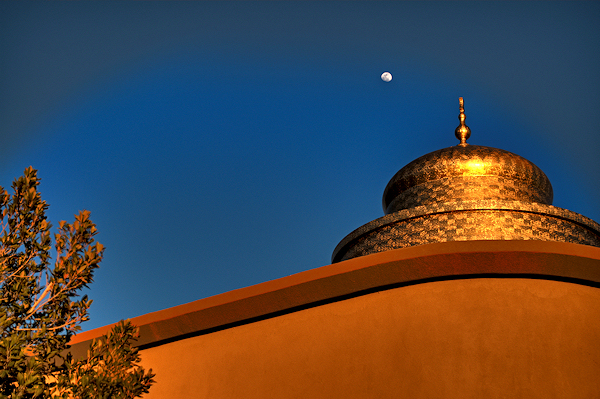 This entry was posted in Processing, Shooting and tagged aperture, Arizona, AZ, blue hour, camera, D5000, desert, Glendale, HDR, moon, night, nikkor, Nikon, Paint Shop Pro, photography, Photomatix, Sikh, software, sunset, Thunderbird, tripod. Bookmark the permalink. The photos look fantastic! I would have to say that these just might be your best work yet. I’ll have to check out the others on Flickr.